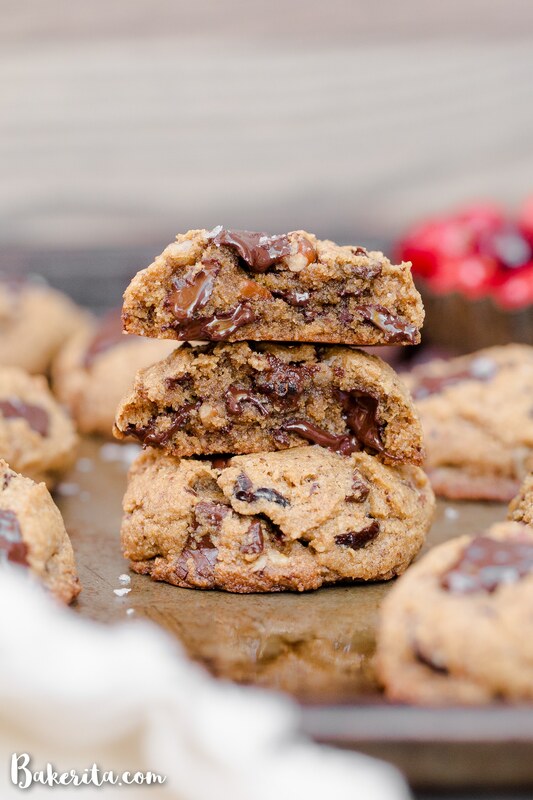 These Cranberry Pecan Chocolate Chip Cookies are gooey in the middle with perfectly crispy edges. Think: your favorite chocolate chip cookie, dressed up with dried cranberries and toasty pecans. I recommend devouring one of these gluten-free, paleo, and vegan cookies warm from the oven. One of my best friends in this food blogging world is Lindsay from Weeknight Bite. Being the small world that this is, Lindsay and I have actually known each other for a verrrry long time – as in, since I was a small toddler! We grew up in the same neighborhood and our parents have been friends since before we were born. I remember going to a party at their house when I was a little four-year-old, but since Lindsay is six years older than me, we weren’t friends at the time. We reconnected a few years back, realizing that in this small food blogging world, we actually know each other in real life, even if we hadn’t seen each other in YEARS. Lindsay reached out first because it turns out, she had discovered my Paleo Chocolate Chip Cookie recipe. Obviously, for our baking date, we had to do a play on the cookies that helped us to reconnect as adults. We decided to do a version of the chocolate chip cookies that are absolutely perfect for the holidays – they’ll be the star of any holiday cookie platters or dessert swaps. To get that holiday twist, we added a hint of cinnamon to the dough – it adds a little bit of warmth and spice that tastes so perfect here. In addition to the chocolate chunks, dried cranberries and toasted pecans are added to the dough too. Altogether, the cinnamon, pecans, and cranberries make these chocolate chip cookies holiday ready. They’re just as gooey and decadent as the originals, with crispy edges and a soft center, but with some added chew from the cranberries, crunch from the pecans, and warmth from the cinnamon. Add a dunk in some eggnog or hot cocoa and you’ll be in holiday heaven! Just don’t forget about them once the holidays are over – these are perfect all year round :) enjoy, my friends, and be sure to check out Lindsay’s post here! 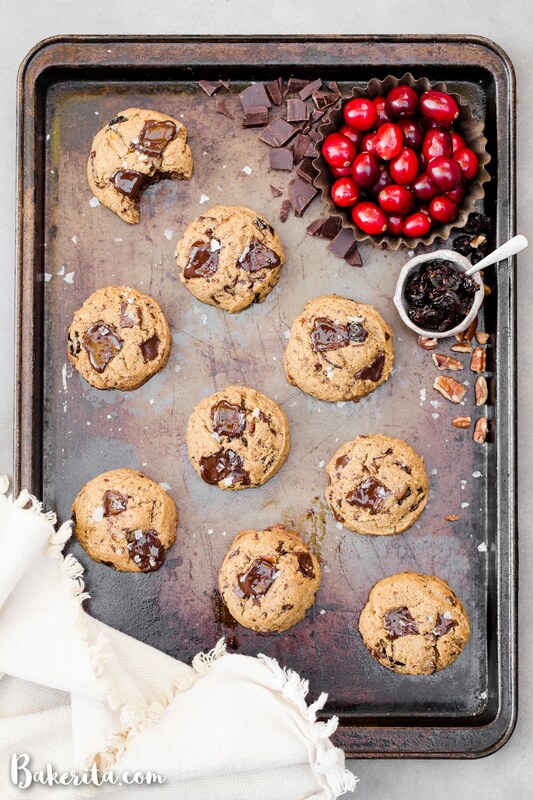 These Cranberry Pecan Chocolate Chip Cookies are ooey and gooey in the middle with perfectly crispy edges. Think: your favorite chocolate chip cookie, dressed up with dried cranberries and toasty pecans. 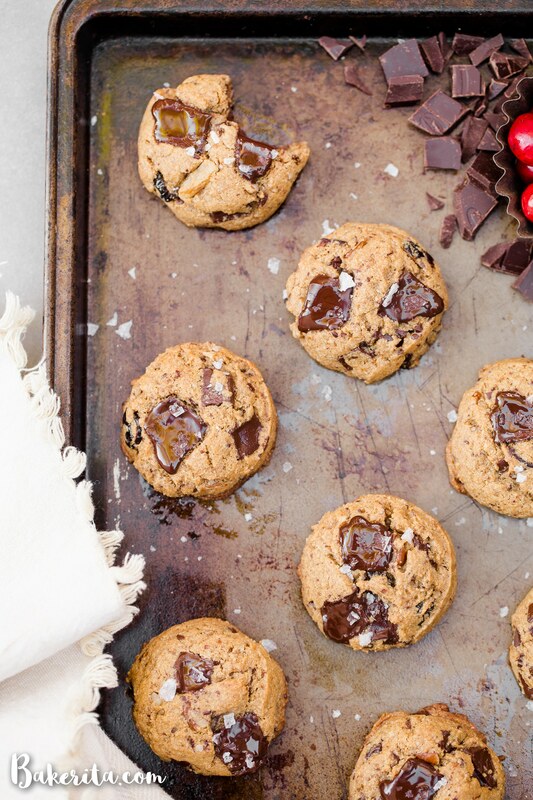 I recommend devouring one of these gluten-free, paleo, and vegan cookies warm from the oven. Add the almond flour, salt, and baking soda to the wet ingredients. Mix until well incorporated. Fold in the chopped chocolate, dried cranberries, and pecans. Cover with plastic wrap and refrigerate for at least an hour (can prepare up to 48 hours ahead of time). When you're ready to bake, preheat the oven to 350ºF. Use a cookie scoop to form cookies and place on a parchment lined baking sheet; press down slightly. Sprinkle with flaky sea salt if desired. Bake for 10 minutes or just beginning to turn golden brown around the edges. Store cookies in an airtight container at room temperature for up to 4 days, or in the refrigerator for a week. 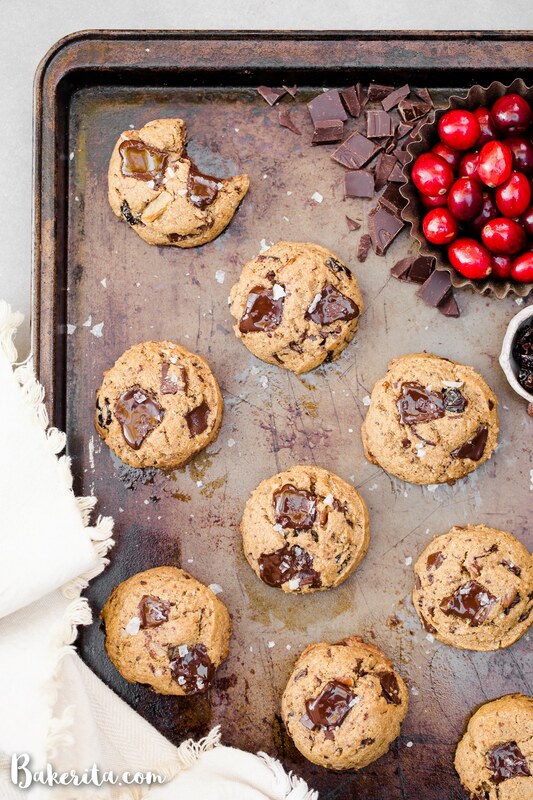 These cookies look perfect, love the chocolate chunks! These look absolutely dreamy! 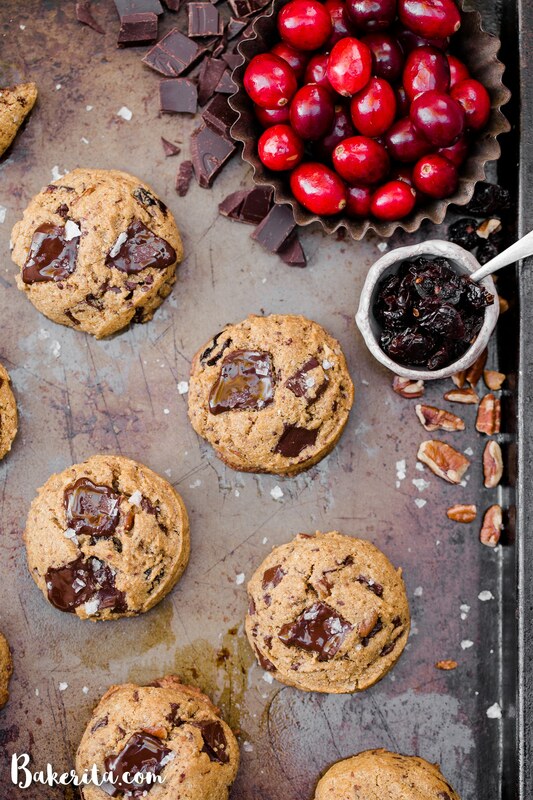 Cranberries, nuts and chocolate are so perfect for the holidays! I made a batch of these for the holidays and they were wonderful! I loved the chocolate chunks, cranberries and pecans mix— every bite is pure yummy-ness! thanks for sharing a great recipe!